We want to share some good news with you. We’re 2 weeks into 2018. And in light of that, we want to take a quick look back at 2017, celebrate some things you know about, and let you in on some things you don’t know about. You gathered together for ShareFest to give our extra to over 500 people in need. You hosted almost 200 kids from this city for a week of Champs Camp, where they had a blast learning about Jesus and worshipping together. You invited our neighbors across the street to a party where we fed them and gave their children over 200 backpacks filled with school supplies. You gathered again and again for Plus One Celebrations, packing out living rooms and kitchens and backyards to celebrate baptisms, thanking God for salvation and life. You blessed Voigt Elementary’s teachers, volunteered at Voigt’s events, mentored their students, and prayed for their faculty. You provided a place every Monday right here in this building for dozens of children to have school. You sent teenagers and adults on mission trips to Houston and China and Nepal. You funded a year’s worth of mission work by an incredible couple in Zagreb, Croatia--who you’ll hear from later on. You served and grieved alongside people who said goodbye to precious loved ones this year. You drove people to AA meetings and made meals for struggling families. You created 4 new small groups, giving 92 more adults and kids a circle in which to love and be loved. You welcomed 66 new members into the RRCOC family and cheered for 21 baptisms. And honestly, all of that is just the tip of the iceberg. You may remember that in 2016 (the year before last) you went above and beyond with your financial generosity. As we closed the year that December, and what you had done over the course of the year became evident, it was so fun to get to share that with you. You enabled some beautiful, incredible things. And you did. Because of your generosity and intentional giving, we ran a surplus this year. You gave more. And so, we did more. Every year we budget more than $30,000 in benevolence--that’s money given to struggling families (inside and outside of our church) to help get them through trying times and enable them to get back on their feet. We pay water bills. We hand out HEB gift cards to help with groceries or medicine. We buy gas. This year, thanks to your open-handed giving, we were able to add an extra $20,000 to our benevolence work, meeting the needs of over 150 families. Some of your extra giving this year enabled us to take care of our aging building and outfit it to meet our growing needs. We added TVs to the balcony, improved our sound system, installed a new security system, renovated classrooms, added a defibrillator in the foyer, kept up the basketball goals in the parking lot as a service to the neighborhood kids who come over to play ball, and, among other things, replaced the baptistry water heater just a few days before we welcomed five people into that water to put on Christ. 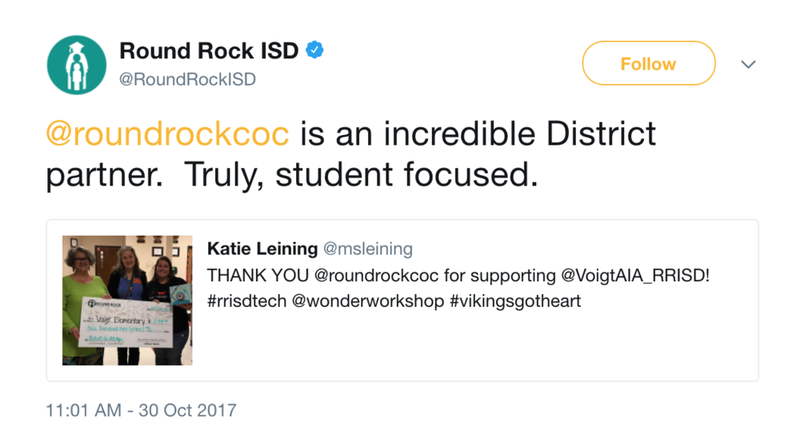 Because of your open-handed giving, we decided to do again what you enabled us to do in 2016 and devote another $9,000 for microgrants to Voigt Elementary to empower teachers to pursue creative and innovative ways of reaching their students. Teachers have purchased books to make their libraries reflective of the backgrounds and races of their students, programs to teach coding and robotics, and supplies to help special needs students create a coffee cafe, in which they sell coffee and pastries to teachers and staff, learning important money and social skills. 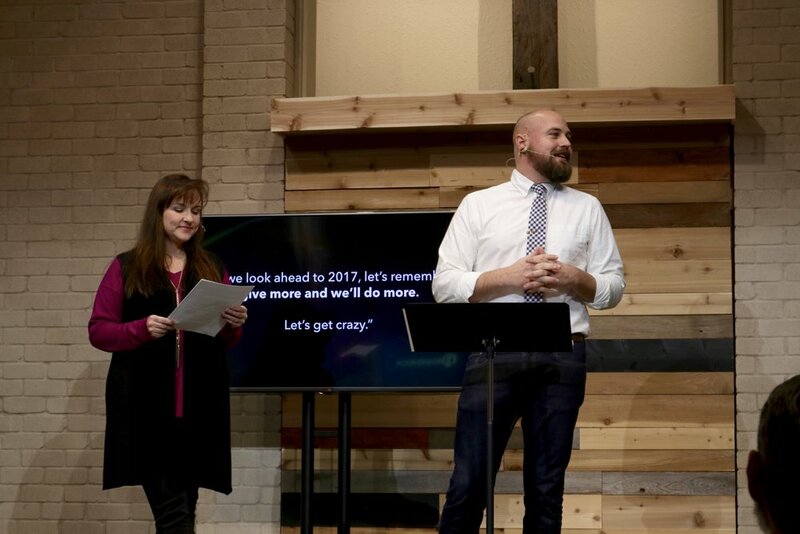 This past year, because of your above-and-beyond generosity, we were able to hire a part time storytelling minister and fund our storytelling ministry--an effort to identify and proclaim what God’s doing at this church. In 2017 we told over 19 stories about how God’s changing our lives. In 2017 we were able to give $15,000 above our budget to help missionaries in Tanzania and Croatia. And in addition to all of that, we still have more money we’re currently in the process of allocating to bless our city, equip our church, and glorify God. This wasn’t an easy year for our church. We made some hard decisions in our efforts to follow God’s leading and those decisions weren’t always popular. It wasn’t an easy year. But it was a good year. In the midst of the inevitable friction of life together, we proved that Jesus was right: we’re better together. You proved that there’s so much power in open hands. In total, your giving last year exceeded our budget by $145,000. That’s what enabled all of that good work we listed. And that’s in addition to the extra you gave in special contributions (for hurricane victims and short term missions) which alone totaled $46,000. This is what it looks like to be open-handed. Thank you church for letting God move through you so powerfully. As you become more and more generous, may he who supplies seed to the sower and bread for food also supply and increase your store of seed and enlarge the harvest of your righteousness. [May you] be enriched in every way so that you can be generous on every occasion, and [may] your generosity result in thanksgiving to God. We have one more thing to tell you about. In November of 2017, we focused our attention on orphans, and God’s call for us to love the way he loves--as a Father who adopts us as his children. And we introduced you to 4 children from Columbia who are in need of families. Abe, Jack and Natalie, and Nelly. We gave you magnets with their faces and challenged you to pray daily that God would provide them a home. You did. And we want you to continue to. But some of you did more than that. Some of you sensed God leading you to go further, convinced that God would enable what he required. Many of you know that our own Josh and Susan Sumpter have decided to pursue adoption. They’ve done a ton of work, completed home studies, and though there’s always less certainty in these things than we’d like, things seem to be progressing well. What you may not know is that the child they’re adopting is Nelly. Now, we’re going to pray with Josh & Susan about this in a second, but we wanted to make you aware of your participation in all of this awesomeness. As most of you know, adoption can be very expensive, and our desire for some time now has been to leverage our collective generosity in the direction of that challenge. And so while the Sumpters have already paid for their home studies, and while they’re fundraising to offset the costs of (Lord willing) bringing Brenda home (I mean, she’ll arrive with essentially the clothes on her back), there remains the main portion of the costs of this adoption: a sum of around $30,000. I can’t wait to meet this little girl. I can’t believe that, Lord willing, our church will have had the opportunity to participate in her story. I can’t wait to watch her grow up in this family. Josh and Susan, would you come up here? We know that even though things have gone smoothly so far, we don’t know what the future holds, and so we want to pray with you, asking God to bring this to fruition, and asking Him to be present with you and reward your obedient hearts no matter what lies ahead. Father in heaven, thank you for this family. Thank you for their hearts to be a family to this precious child who has no parents. Father, give them everything they need for everything you’ve called them to. Thank you for the generosity of this church. Thank you for the courageous hearts of its shepherds. Thank you for writing this story and for writing us into it. Please enable this adoption. We want good, good things for Brenda--keep her close to you. And if for some reason there’s something else that’s even better for Brenda, give Susan and Josh the strength and comfort they’ll need to adjust to that. But our desire, Father, is that you would bring Brenda home...here. And that you would continue to enrich us in every way so that we can be generous on every occasion. In Jesus’ name, amen.